Oil prices in have rebounded to the low $60s as the OPEC+ supply curtailment deal starts to rebalance the market. But residual high crude inventory and fears of slowing oil demand growth continue to pressure oil prices and dampen upstream investment sentiment. Looking back, 2018 was a relatively good year for production floater orders. Contracts for nine FPSOs, a production semi, two production barges, two FLNGs and more than a half dozen FSRUs were placed during the year. All is discussed in our January report – along with an updated profile of construction activity in the FPSO sector. 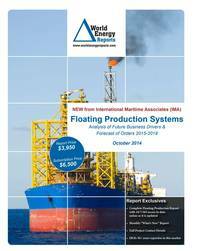 In the data section are details for 219 floater projects in the planning stage, 45 production or storage floaters now on order, 302 floating production units currently in service and 31 production floaters available for redeployment contracts. Charts in the report update the location where floating production and storage systems are being planned, operating, being built and to be installed. Accompanying excel spreadsheets provide the report data in sortable format. Information is current as of 23 January.